Price includes one hog of any size per Hunter, per day. So if you purchased a 3-day hunt you are allowed to take three Hogs! No trophy fees apply to wild hunts. Multiple-day wild hog hunts start at 2 p.m. and will end at 11 am on your last day. The perfect hunt package for the Adventurous Outdoorsman. Your wild Hunt will begin at 2 p.m. by meeting your hunting guide for a brief orientation, and some range time to make sure your weapon is ready to go. Hunters may bring their own weapon of choice or rent one of our premium rifles with ammunition included. Bring your sense of adventure! Jump on our Swamp Buggy with one of our experience guides and enjoy a ride through the undisturbed Wilds of Florida. You’ll be hunting in one of our many house blinds, rifle tree stands, archery tree stands or ground blinds located near a feed station to give you the ultimate advantage. Wild hogs are extremely wary and will give even the most experienced Hunter the challenge of a lifetime. Although our wild hunts are not guaranteed, our Hunters enjoy very high success rates. You may choose to hunt alone or have a guide sit with you for the entire hunt for no extra charge. These hunts are perfect for the single hunter or large groups, as we can accommodate over 25 Hunters at a time with plenty of room to spread people out on our large private ranches. Due to the unpredictability of wild animals we always recommend booking or wild Hunt in a multiple-day package. If you only have one day to hunt and you really want to make sure that you’re successful. You can book a guaranteed one day hunt by clicking this link here. Don’t forget we offer private Lodge and Cabins for only $85 a night. You will have the option to reserve that when filling out your booking forms. 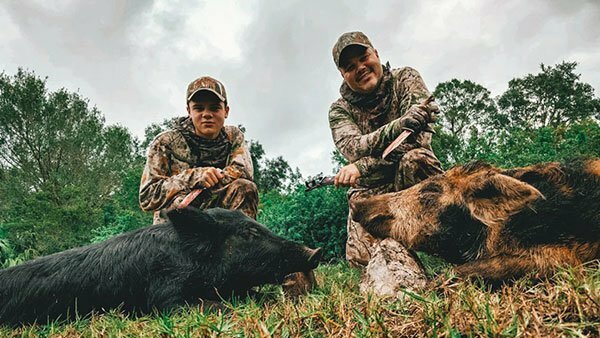 Experience traditional Florida hog hunting in the expansive wilderness of South and Central Florida.